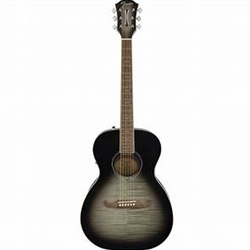 Visually stunning, with a gorgeous flame maple top, Fender's FA-235E Concert acoustic-electric guitar offers legendary Fender sound at a budget-friendly price. The FA-235E Concert features quality laminate construction with a modern Fender 3+3 headstock and Viking bridge for an easy-playing instrument that sounds just as solid as the name behind it. Fishman electronics are onboard, so you can confidently take the FA-235E on stage and you are ready and able to plug in. Developing and experienced players alike will appreciate the mahogany neck that gives this Fender acoustic-electric guitar a lively tone while complementing the flame maple top.